To refresh your memory of the original issues, you can read about them here, but that was just the beginning. He finally bought the wood we needed (more than a month after we paid him for it), he got it all dried out, and it only took him one week longer than promised to prepare the wood – sanding and varnishing. We were in the midst of a retreat when the wood was delivered and didn’t take the time to really check on it. We just saw that it had finally arrived and looked good from a distance. 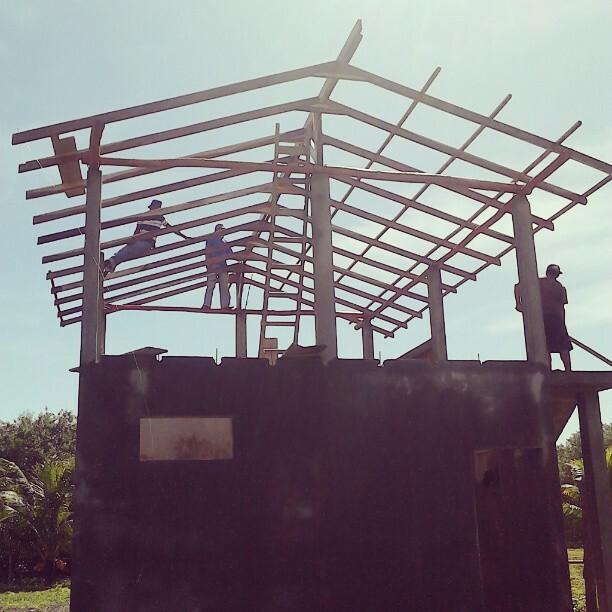 The next day our awesome team of workers had the roof beams or alfajias already installed. They were shorter than we’d been expecting by about 20cm. We wanted the aleros or overhangs to extend well over the stairs, but they ended just inside the edge of the stairs. Juan Ramon our carpintero had screwed us again! 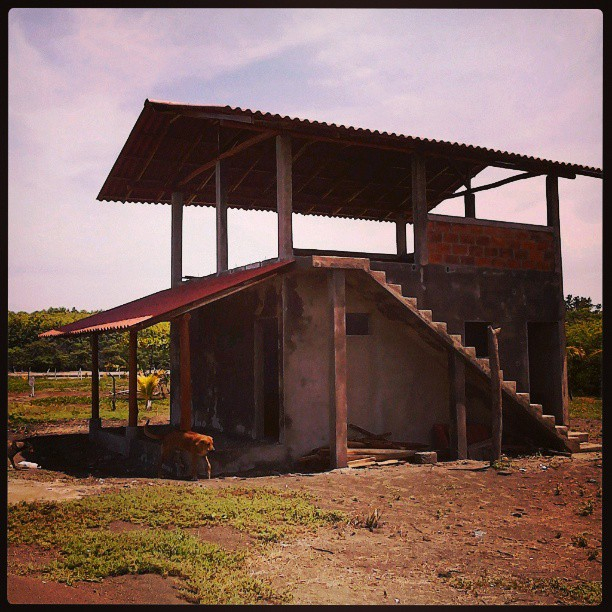 In Nicaragua certain things like wood and well depths are measured in varas. 1 vara = 33 inches. We had ordered 2x4s at 5 vara lenghts but the carpenter only delivered 4.5 vara beams. He blamed it on us. It’s true that we did change the roof design after our initial wood order. We had been thinking of using a hip roof with 4 planes or cuatro aguas but when we were ordering the roofing panels (Nicalit) we learned that they don’t make cumbreras (the part that covers the ridge line) for hip roofs. So, we decided we’d just use a gable roof or dos aguas. That adjustment changed the quantity and size of roof beams that we needed and we sent the carpenter the new list. Instead of 4.5 vara lengths, we needed 5 varas. He claimed that even though the wood wasn’t at his shop by then, he had already bought and felled the tree in preparation for 4.5 vara lengths, so that’s what was delivered. We believed him at first and figured it was our fault…. until we found the original list of wood that we ordered and noticed that even there we had asked for 5 vara lengths. But it didn’t matter at that point. The wood was installed. There was nothing we could do. Our contractor said he’d have the panels overhang the wood by just a few inches more than they normally would and that would give us enough length to fully cover the stairs. It’s looking good! The wood looks beautiful and we’re happy with the work so far. The next step will be installing the wood floor. More updates coming soon! 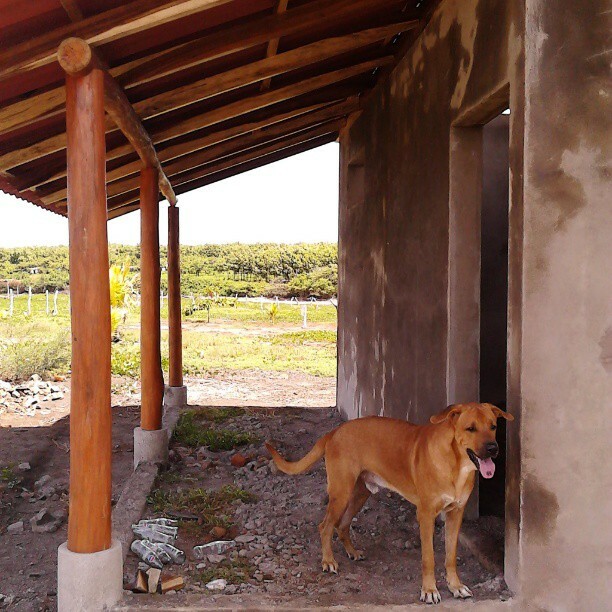 This entry was posted in Building in Nicaragua and tagged beach house, building in nicaragua, cumbreras, guanacaste, holly beck obermeyer, kim obermeyer, nicalit roof panels, nicaragua, roof construction. Bookmark the permalink.